Adventurous eating is a relative term: what makes one person squeamish might be a tasty snack to another. And thanks to a new pop-up featuring edible insects happening in Santa Monica this week, you can find out if you’re up for the adventure. Ready for some BBQ beetle tacos or a Thai mealworm salad? Bring. It. On. 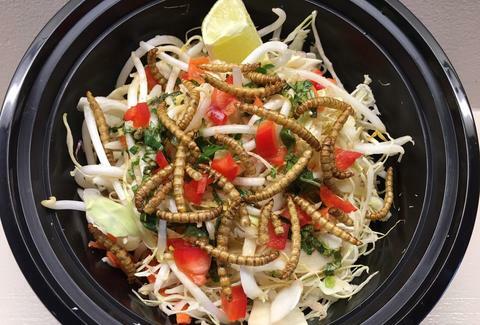 The one-day pop-up “Pestaurant” -- as the temporary bug eatery will be known -- is sponsored by pest control company Western Exterminator, which partnered with Santa Monica eatery Mondo Taco to create a menu of creepy-crawly delicacies. Besides the mealworms and beetles, you can also chow on Jamaican jerk grasshoppers with pineapple salsa, and for dessert, rice “cricket” treats and “Chocolate Goes On Everything,” which we’re going to guess means lots of insects here. The pop-up will go down on the Third Street Promenade on Saturday, October 8th from 11:30am-3:30pm, and all of the bug bites will be free, with Western Exterminator donating $1 for each dish eaten to the Westside Food Bank with the goal of raising $3,000. There will also be a cricket-eating competition with an additional $10 donated for each participant. So, come hungry. Part of the goal of the pop-up is to show that while some insects can be a destructive nuisance, others can offer an environmentally low-impact, sustainable, and nutritious protein alternative -- which should obviously be a big hit for eco-minded, Paleo-eating LA. And while some Angelenos may have munched on a few insect dishes like grasshopper (aka chapulines) tacos at Guelaguetza, silkworm pupae soup at Mok Maru Jong Sul Jip in Koreatown, or waterbug relish at Night + Market Song, this looks to be the first all-insect eatery in the Los Angeles area -- if only a temporary one. And while the “Pestaurant” may be a clever marketing stunt, it’s also a fun way to try out some sustainable eats while raising cash for a good cause. And who knows, maybe grasshoppers and crickets will become your new favorite snack. Danny Jensen is Thrillist's interim LA Editor; follow him on Twitter and Instagram.